Mornings are by far the hardest part of the day for girls. Some of them have a lot of responsibilities while others prefer to sleep in. That’s why we all get either lazy or just don’t have enough time for styling our hair. In this article I’m going to show you some easy but at the same time cute and chic hairstyles with simple step by step tutorials which need a little time and effort from you. It's really simple. To make it look more interesting, you can place your bobby pins in X shape—creating a new accessory out of them! To add some volume to your hair you can try teasing them before pinning. All you need to do is just to bring your hair to one side, and then gather the section of hair around back of your neck and tie it with an elastic. Then, put the rest of your hair on it and it's ready! Twist back a small section of hair from both sides of your head, and secure them with a pin in the middle of your head. It has some similarity with the twisted halo but you also place a headband over your head and loop the hair through the band until it's fully covered. After that just pull the hair together and let it fall down in the back of the head. 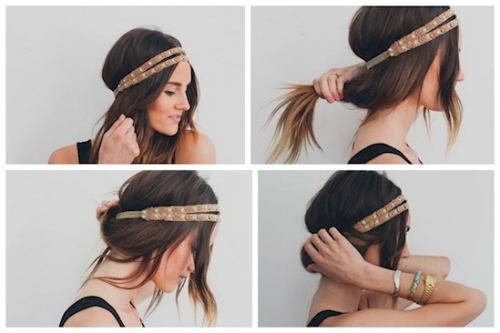 It's similar to the half tuck style though here you need an elastic headband over your hair. Simply tuck the ends of your hair gathered into a ponytail into the back of the headband, and roll your hair inside the band. You can even use an elastic flower crown for a princess style. 6. BEAUTIFUL CURLS IN 5 MINS! Did you know that to get beautiful curly hair you don't need to use the curling iron for the whole hair? 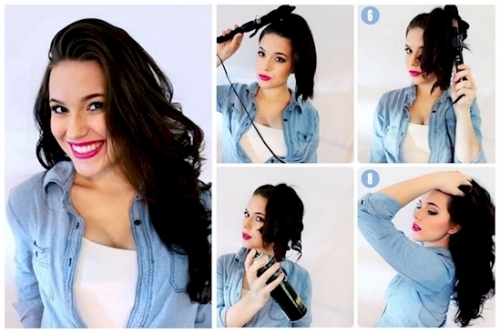 All you have to do is gather your hair into a ponytail and just curl that part of your hair. Add some hairspray on to make your hair remain longer in a desired shape and let your hair down. That's it, beautiful curls are ready! 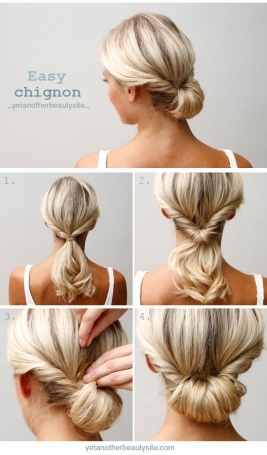 Here is a way you can make a simple ponytail into a special richer one. Just make 2 separate ponytails. That will add more length and volume to your hair. This simple style is often used during fashion runways. 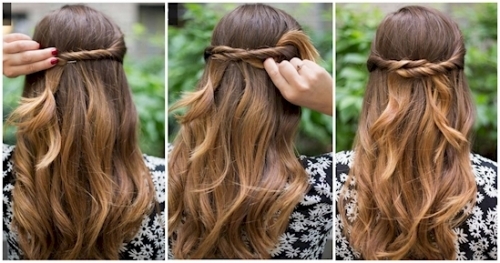 Divide the front half of your hair right behind your ears. You can tease the upper part for fullness on top. 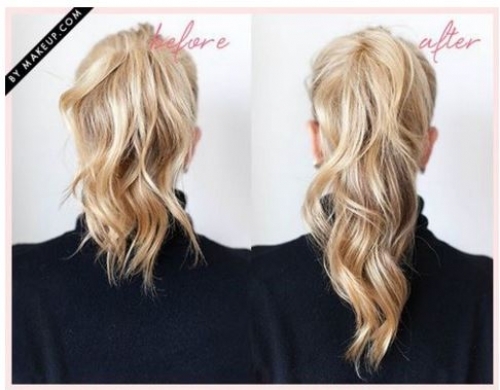 Fix the back section into a low ponytail. Pull the left section back, and wrap over the pony. Fasten underneath with a few bobby pins. Repeat the same for other parts. You can also use hairspray to fix the result. You need a light holding styling mousse applied all over your hair. Just section the hair over your shoulder into two pieces and tie hair into a simple knot. Fasten the two ends together using a clear elastic. You can also use a bobby pin for more safety. Tease the ponytail a little for texture and then comb through it with your fingers to settle it. You can complete the look the way you like. Messy buns are easy and fun but they often fall apart at the wrong time. With this bun you can feel safe as it'll remain in its place without trouble. First of all, gather your hair into a ponytail. Then make a braid and pull it forward. 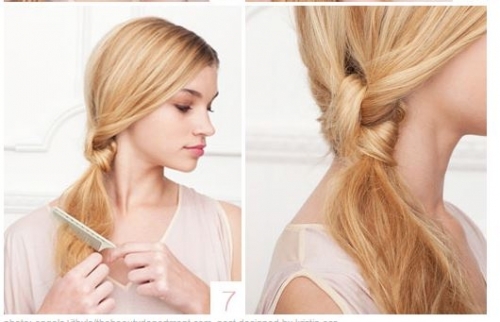 Fix the top of the braid to your head and roll the end of the braid inside. And in the end pin down your braid inside the ponytail and around it. You should start with straight hair. Separate your hair down the middle into two equal parts. Gather two pigtails, tie them into a knot and fix with bobby pins. Twist the upper part, and carefully pin as you wrap around the knot. Repeat with the rest of the hair, twisting the opposite direction. 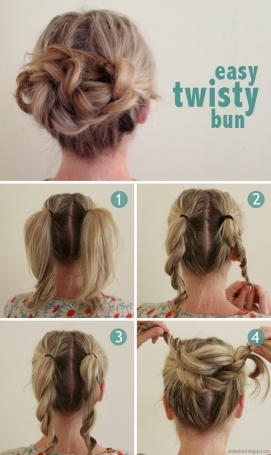 Accurately hide the ends under the bun and finish with hairspray! You'll need to use a hair doughnut to create a perfect bun, and then separate the rest of the hair into two braids. 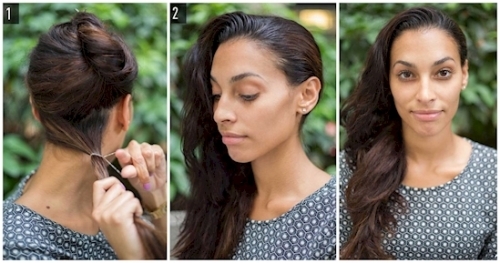 Wrap the braids around the bun, and then fasten them with bobby pins. Again separate your hair in the middle and create two pigtail braids. Twist the braids around each other and accurately fix with the bobby pin. This version is wonderful for office style. 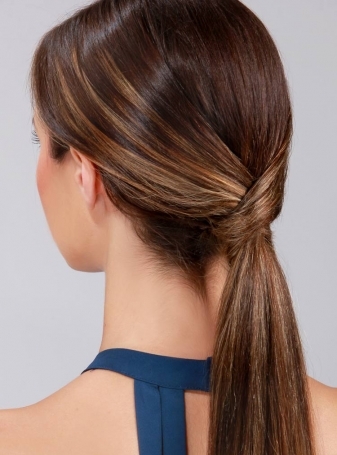 Twist both sides of your hair and then create a low ponytail. Pull your hair inside the ponytail. Then roll the rest of your hair up and secure it with bobby pins. And the best for the last. 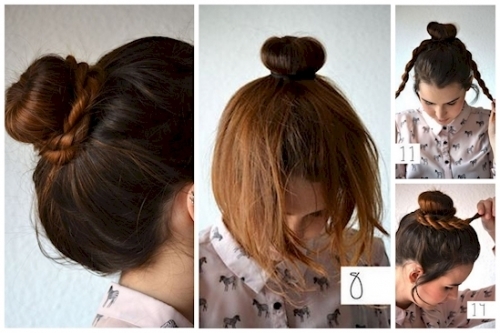 The bow bun can be made in less than 2 minutes. 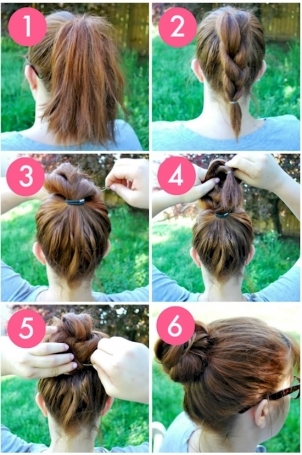 Just create a messy bun on the top of your head, leaving a small section of hair loose. 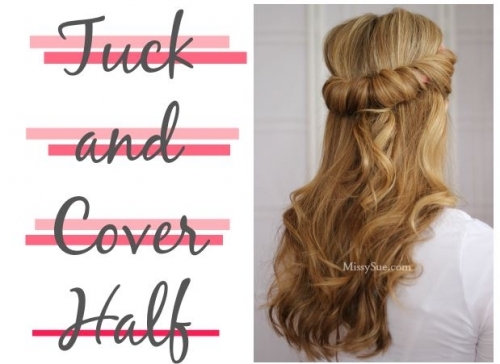 Separate the bun into two equal parts and pull the loose section of hair over, securing it with bobby pins.